Four Seasons Resort Lāna‘i. Kristen Ahrens photo. With contrasting landscapes across only 140 square miles, secluded Lāna‛i offers visitors unique options for island adventure. 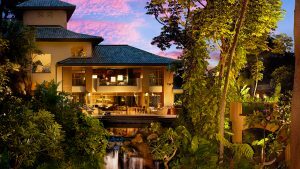 The new Island Adventure Center at Four Seasons Resort Lāna‘i offers guests and day visitors a range of new activities. Ride horseback through wooded upland trails or explore heritage sites on a UTV tour and discover untouched Hawai‘i. Sleek Airstream trailers nestled within the forests and plains offer a welcome respite, with comfort stations, toiletries and refreshment for adventurers. 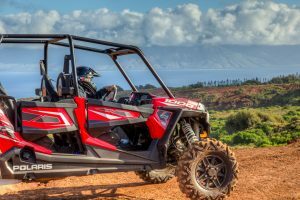 Explore Lāna‛i off the beaten path in a guided Polaris UTV (4-wheel Utility Terrain Vehicle) cultural tour. Weave through the island’s majestic Ironwood forests and verdant valleys around the Palawai Basin area to inspiring scenic vistas overlooking the Neighbor Islands. Guides maneuver the trails while sharing their knowledge of the history of the island, the natural environment and heritage sites only recently uncovered through preservation work that focused on managing invasive species growth, and improving road repair, allowing this new access. Guided two-hour trail rides are offered daily. Day guest rate $395 per couple, $247.50 single supplement, preferential resort guest rate is available. Transportation to and from the Adventure Center is included. Or begin the day with a two- or three-hour tour of a mountaintop heiau (sacred temple site), Pu‘u Makani, with vistas of water and forests on either side, then head to the Naha lookout for sunrise. Travel over to Bench Lands for a cultural tour of the Waiapa‘a area or Hi‘i, a Hawaiian dryland agricultural complex that had been covered over by pineapple cultivation for many years, and inaccessible to visitors. Preservation workers have planted taro and wauke, paper mulberry used for making clothing, and removed eucalyptus, albizia and silver oak trees from an area containing remnants of a heiau, an imu and a lua pau (refuse pit). Offered daily, rates are $495 per couple or $375 per person for two-hour tour (24-hour advance reservations are required). Transportation to and from the Adventure Center is included. Guests can pre-order breakfast to go as an add-on experience. Additional custom UTV tours are available upon request. 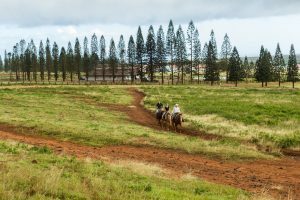 Horses offer an alternative way to explore the wooded valleys and trails of the extraordinary upland terrain of the Kaka‘alani Flats. More experienced riders can venture farther afield together on a guided tour, while couples may just find romantic inspiration on a custom sunset tour. Horseback rides are offered daily and last 1.5 hours. The day-guest rate is $195 per person. Transportation to and from the Adventure Center is included. A preferential resort guest rate is available. Lessons and children’s rides are also available upon request. Newly Director of Equestrian and Island Adventures Keith Moon is spearheading the new initiative. With more than 40 years of experience working with horses, Moon, a former Wyoming cowboy, farrier and big-game hunting guide, brings his knowledge of animals, agriculture and experiences to the island to create unique, and enriching programs for resort and day guests. For more information about Island Adventure Center offerings, go online , phone (808) 565-2072 or email adventure.lanai@fourseasons.com . Learn more about the hotel, go online  or call 1-800-321-4666.